(Newser) – New York's financial regulator said his agency has reached a $340 million settlement with Standard Chartered Bank to resolve an investigation into whether the British bank schemed with the Iranian government to launder $250 billion from 2001 to 2007. The bank will pay the civil penalty to the state and strengthen oversight of overseas transactions. 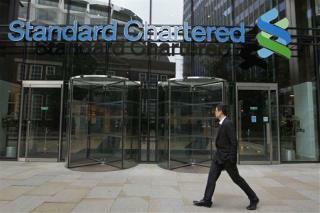 Standard Charter will install a monitor for at least two years who will evaluate the money-laundering risk controls of its New York branch and take corrective measures, the department said. Some one has to do what FEDs will not based on cronyism with big global banks, and corruption their aware of. Iran is the enemy, but in the financial world, there are no enemies only transactions and money made. Whats wrong with that picture? ...and nobody goes to jail because their parents partied together and they all went to school together. The "enforcers" and the perps. Really good schools.